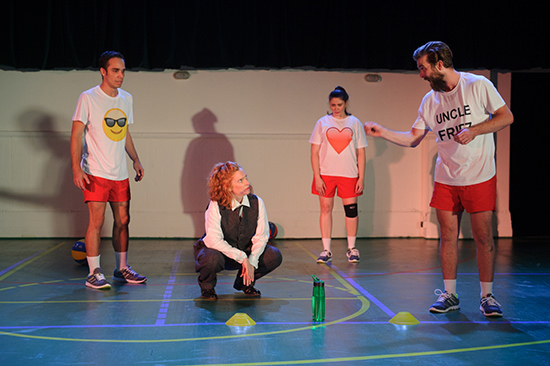 Bright World opens with a chilling recollection by co-playwright Elise Hearst. As a child on Jewish school camp, she was warned by her elders that the local townsfolk were suspicious and fearful of her kind, having been told stories of their wicked ways. Hearst wasn’t the only kid left crying. In the end, it was all a bizarre lesson—see how easy it is to fall for a story? The truth was not in what was recounted, but in the telling. It’s a lesson that underscores every aspect of the play. The work began when Hearst learned of William Cooper, the legendary Aboriginal activist whose struggles to achieve racial equality in Australia were notable enough, but who also led the world’s only private protest against the horrific treatment of Jews in Europe during and after Kristallnacht. This was at a time when Indigenous Australians were a long way from being recognised as citizens—as humans, in many cases—and outspoken protests were more likely to result in ration cuts than global change. Today Cooper is a hero in the Jewish community both in Australia and Israel, but in 1938 he was merely doing what he knew was right. Hearst has co-written the play with fellow playwright Andrea James, herself a descendant of William Cooper, and the work’s two historic threads trace the long life of Cooper alongside that of Hearst’s grandparents, who would flee Austria during the period of Cooper’s protest. Given the obvious potency of these two narratives, it’s odd that the strictly historical sequences in the play are the least engaging, though not at all dull. They’re relatively straightforward reconstructions, however, at least compared to the frame into which they’re placed. This is a work that deeply and effectively problematises the act of telling. Hearst and James perform as versions of themselves, describing the way their troubled working relationship unfurled throughout the creative process of writing, and admitting to their prejudices and presumptions regarding the other. “I think it’s cool to be Aboriginal,” Hearst confesses to James during an online exchange, while James is scornful of her “posh” collaborator. Cooper’s story can be seen as the coming together of two oppressed communities, but James and Hearst don’t paint their own union as a rosy one. Bright World is richly invested in intersectionality and the difficulties it presents. The intersection of Aboriginal and Jewish cultures is the most obvious case in point, and there are musings both charming and melancholic on the ghettoisation of writers—is James always and necessarily an Aboriginal writer? If Hearst creates Jewish writing, why doesn’t she produce red-headed writing? These questions are embedded in the structure of the work, too. It’s a shocking moment when an Anglo-Australian actor slips into the role of Cooper’s teacher, a Tamil from Mauritius, complete with his attempt at an accurate accent. James eventually lambasts Hearst for thinking it’s okay to cast a white actor in the role, to which the latter objects that Indigenous actors are playing Jewish figures in other historical scenes. Actors are playing across gender, too, and the struggle to nut out the thorny issues of access, opportunity and authenticity ultimately culminates in a fully fledged fight over who can claim to be most oppressed, a battle that turns physical at one point. 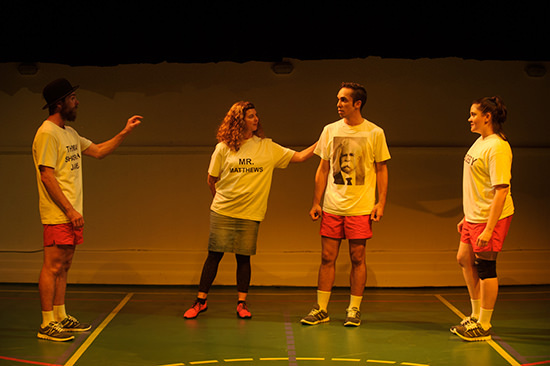 None of these issues can be compromised, but the playwrights realise they’re working with limited resources to bear witness to a story too few know. If they don’t tell it themselves—problems and all—who will? 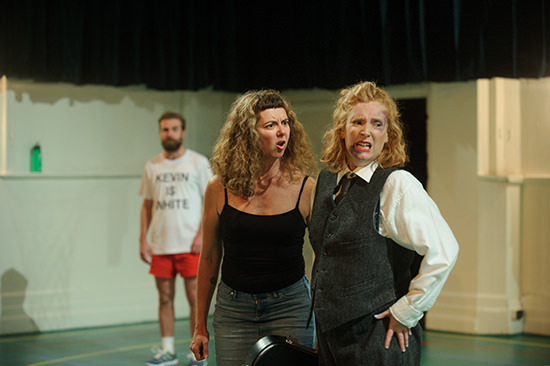 Paige Rattray’s direction appropriately emphasises the constructedness of the enterprise, setting the whole thing within a school gym and largely eschewing period costume for basketball shorts and t-shirts with slogans or emoji nodding to the character being played (“WHITE ACTOR” elicits big laughs by the time it appears). The playfulness of the mise-en-scène plays counterpoint to the seriousness of the themes explored, though that playfulness runs throughout the meta-theatrical written frame too.